College of the Sequoias Hanford Education Center will be undergoing some changes as the college aims to give students a campus with a more traditional college feel. The college has both an expansion project and a construction project on the horizon. Due to enrollment growth, COS President Stan Carrizosa said the Hanford campus of almost 2,000 students needs more academic space and a means to accommodate more students. He said one planned project will expand the education building to add three more portable classrooms, plus a few offices, a conference room and some restrooms. The college, located at 925 13th Avenue, will not only be adding more classrooms, but the construction of the new student pavilion in the center of the campus to give students a place to congregate when they are not in class, Carrizosa said. In a student survey conducted in 2015, Carrizosa said many of the students liked the fact that the Hanford Center felt like a close-knit environment with accessibility to faculty and staff. He said students also wanted facilities to make the campus feel more like a college campus. He said these new projects are a response to what the students wanted. Carrizosa said the student pavilion will be a lot like a college quad area. He said it will have a concrete foundation and a shade structure with furniture underneath the covered area. He said it will be a common place for students to gather and will be wired for a speaker system for announcements or music, and there will also be a projection screen for videos. Aside from student activities, Carrizosa said the pavilion could be used for community events because there are plans for a small amphitheater that could accommodate around 200 people. The $1.6 million pavilion is made possible by funding from the state, plus increased funding due to the college growing and becoming a State Center Community College, which provides an additional $1 million per year, Carrizosa said. He said the additional classrooms will cost $1 million and will be paid for with general facilities money and money from the $22 million bond “Measure C” that was passed in 2006. 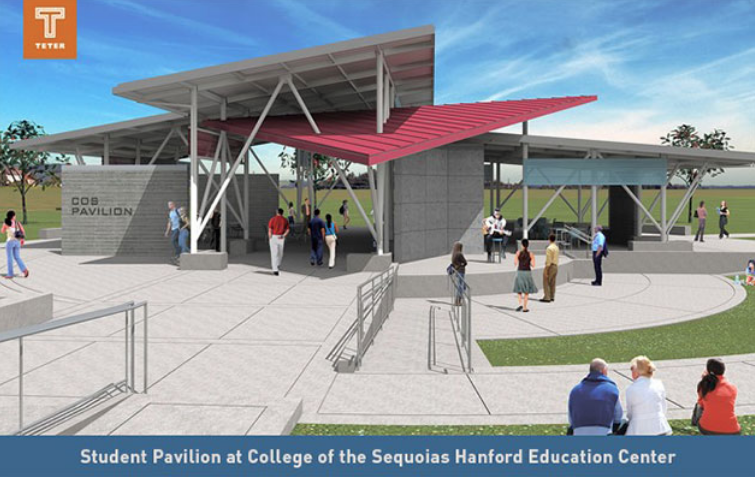 COS Hanford Center Provost Kristin Robinson said she believes the student pavilion will provide a place for students to gather for a multitude of activities. The new classrooms will alleviate some of the pressure from the rest of the campus, Robinson said, especially because the student enrollment continues to grow. She said she is looking forward to the new room that will be used to support student services, whether it will be used for tutoring, counseling, computer labs or something else she isn’t sure of yet. The campus offers two anchor programs in the public safety arena – two police academies every year and a firefighter academy in the spring of each year. The campus also provides vocational classes for electrician training and industrial maintenance, prerequisites for registered nursing programs and general education for transfer to a four-year college. The limited number of classrooms meant many classes had to be taught at night because there were not enough rooms to accommodate the number of classes and students. Carrizosa said some classes had to be taught in buildings that were not appropriate, like an English class being taught in the Public Safety Building, for example. Carrizosa and Robinson both said the additional classrooms will allow for more day classes and more flexibility in class schedules for students. COS Board of Trustees member John Zumwalt said the Hanford Center has been successful and as a result is starting to outgrow the space it has. He said the new classrooms will make the entire campus work better because they will allow for more classes at more convenient times for students and their busy schedules. Sue Sorensen, a board member for the COS Foundation, said the pavilion is something that can make a huge difference in making the campus feel more like a college campus for students. She said the growth at the COS Hanford Center is also a positive for the city of Hanford because as educational facilities expand, opportunities for the community expand too. “I think it’s going to be a nice, user-friendly design that even the community can have for events as well,” Sorensen said, adding she is excited about educational opportunities that keep coming to Hanford. Carrizosa said the additional classrooms should be ready when the fall semester begins in August. The student pavilion will start initial construction this month and Carrizosa said he hopes for it to be ready for students to use by August as well, though he admits it may take longer than he hopes.